We've all been there - we love cooking with kids but sometimes we're in a rush and just want to get dinner done quickly without 'help' from small people. This is precisely the time of day when they will therefor start hanging off you, grizzling and making demands however full and busy a day you have had with them, they want your attention RIGHT NOW. So how do you head this off at the pass and get your job done without losing it and becoming a shouty monster? This is such a simple solution you may already be doing it, or if not will wonder why you didn't think of it. It also helps to prevent the snowstorm of toys all over the house that are never played with. It will take a couple of hours to set up initially if you haven't already done it, but after that it is super fast to implement. You will need an empty bookcase somewhere that the kids don't spend a lot of time, plus enough boxes to sort out the toys into groups - I find the cheap fold out fabric ones from IKEA fit two boxes to a shelf, which is handy. I group by type of toy, a box of wooden tracks and trains for example, another of Lego, one of plastic animals and so on. The trick is that the toys are out of sight and out of mind - this is not a self service area. Our toy bookcase is in one of the kids rooms because they are a bit too little to play upstairs by themselves so we spend most of our time downstairs together, in the back yard, or out and about. When you need the kids to be busy doing their own thing, take down a box of toys from the shelf and give it to them to play with. No more than one box out at a time so that it stays fresh and interesting. Today I put away the Chuggington train set they had been playing with for a few days and gradually losing interest in. 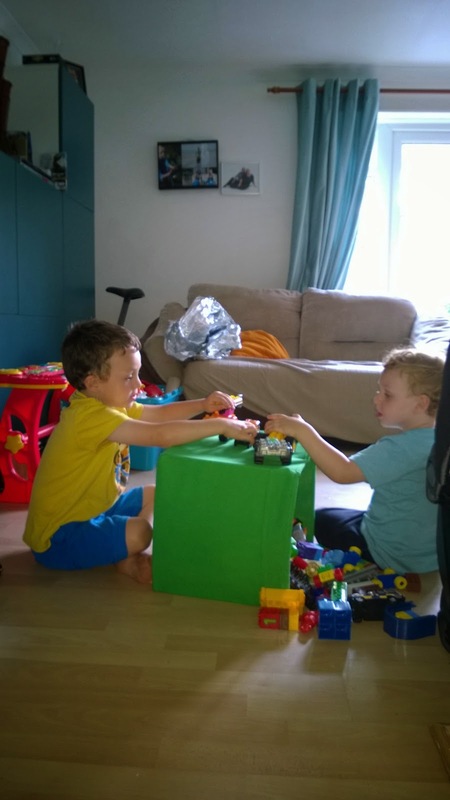 At that time when I needed peace to cook I pulled down the box of Megablocks and put it in the living room for them to play with. Dinner was cooked, served and on the table with no grizzling or moaning, and dinner eaten peacefully with the promise that Daddy would play Megablocks with them after dinner.